I hope you all had a wonderful, memorable Christmas yesterday. Our family had a lovely day with fun, good food, and great company. It seems like we were preparing for Christmas for weeks and then, in a flash, it was over. Now that we’re on the other side, I’m adjusting my focus on the New Year. January 1st always seems to sneak up on me anyway, but this year, I’ve got two new releases coming up that I’m really excited about. I thought I’d share a little about them. 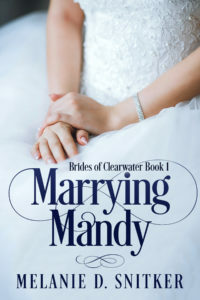 Marrying Mandy is the first book in my new series, Brides of Clearwater. This is also my first title published by Kindle Press. I know that many of you helped by nominating it on Kindle Scout some months ago, and I sure appreciate that! 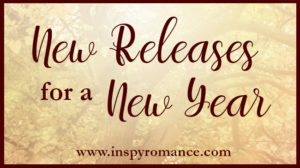 Marrying Mandy releases January 2nd, and is available for pre-order. 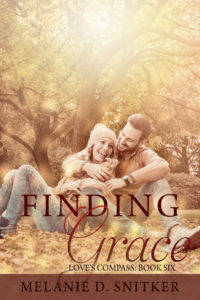 Since Finding Grace is the sixth and last book in the Love’s Compass series, writing it was bittersweet. In addition to telling Tyler and Beth’s story, I also had the opportunity to tie up a few loose ends with some of the characters in previous books as well. Finding Grace releases January 3rd. I am looking forward to reading these books. They both sound great! Thank you, Ellie! I hope you and your family had a wonderful Christmas! Hi Melanie! Congratulations on your new releases! They both sound inspiring. Best wishes and Happy New Year. Thank you, Renate! Happy New Year! Happy New Year, Melanie! I voted for Marrying Mandy and am looking forward to reading it. I’m also anticipating Finding Grace to finish off the series. I appreciate that, Sherri! I hope you have a wonderful New Year! Hello, Melanie! I voted for Marrying Mandy and loved the book! I didn’t realize we could write a review yet, so I will get that done. I’m looking forward to reading Finding Grace. Happy New Year!!! I’m so glad you liked Marrying Mandy! Yes, everyone who got a free copy for voting can review it early. Thanks so much! <3 Have a wonderful New Year! I voted for Marrying Mandy too, and enjoyed reading it. I think I’ve got a review ready to go when it’s officially published. Thanks, Margaret! If you received an early copy, you can leave a review anytime! IT’s one of the nice things about publishing through Kindle Scout. I appreciate it and hope you have a wonderful New Year! I voted for Marrying Mandy…it is on my Kindle and will be the next book I read! I hope you enjoy it, Jackie!